Irish boy band Boyzone is going on their 25th Anniversary Tour, after which, the group will split for good. Manila date has been set for August 26, 2018 at the Mall Of Asia Arena as confirmed by Ovation Productions. This is the final chance for their millions of Filipino fans to watch them perform together. The group members are composed Ronan Keating, Keith Duffy, Mikey Graham, and Shane Lynch. Boyzone has had 21 singles in the top 40 UK charts and 22 singles in the Irish charts. They are one of the most successful bands in Europe. Boyzone was put together in 1993 by Louis Walsh who is also known for managing Westlife. The group split in 1999 and made a comeback in 2007, originally with the intention of just touring. Now, they have a fantastic new album out in time for their 25th Anniversary and it’s called Thank You & Goodnight. 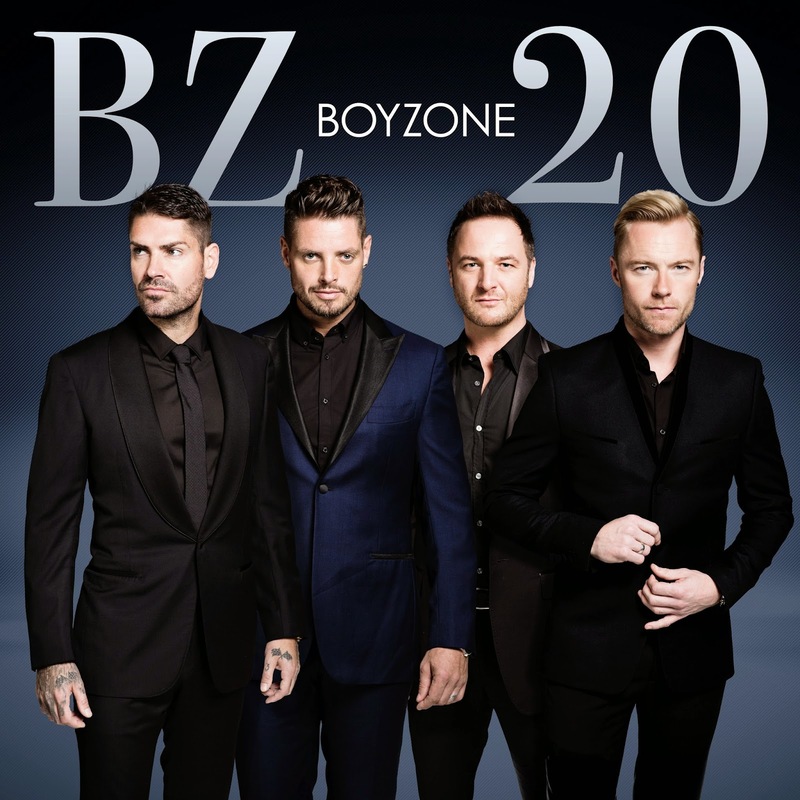 Boyzone’s most loved hits include Love Me For A Reason, Daydream Believer, Key To My Life, So Good, Father and Son, Should be Missing You Now, Close To You, Words, Picture of You, Baby Can I Hold You, I Love the Way You Love Me, No Matter What, You Needed Me, What A Wonderful World, Everyday I Love You, What Becomes Of the Broken Hearted, among many others. Ovation Productions, headed by veteran promoter Renen de Guia, is also the promoter in the Philippines of other well known boy bands The Backstreet Boys, New Kids On the Block, Boyz ll Men, Color Me Badd, All-4-One, K-Pop’s Big Bang, and also co-produced One Direction at the MOA concert grounds. Ovation celebrates its 40th Anniversary next year. 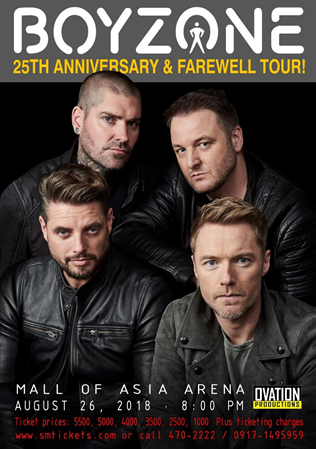 Boyzone 25th Anniversary & Farewell Tour tickets are available at SM and online through www.smtickets.com starting Thursday, 5 July 2018. Ticket prices are P5500, 5000, 4000, 3500, 2500, 1000 plus ticketing charges. For info call 02-4702222 or 0917-1495959.